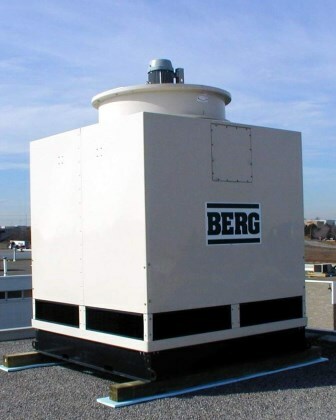 Fiberglass Cooling Towers | Berg Chilling Systems Inc.
Berg’s line of fiberglass industrial cooling towers are manufactured of extra thick fiberglass and premium quality components to provide years of trouble-free, low maintenance performance. They feature a host of standard features and are supplied fully assembled on a structural steel integral base for easier installation and hook-up. Berg fiberglass industrial cooling towers are shipped from our factory fully assembled on a structural steel integral base ready for installation and hook-up with a standard 8-inch water outlet connection. The fiberglass reinforced polyester (FRP) shell and basin is constructed of chopped glass/resin spray-up using commercial grade type “E” glass fiber, with a isophthalic polyester coupling agent. The outer layer is a 15 to 20 mil thick gel coat compounded with ultra-violet inhibitors. 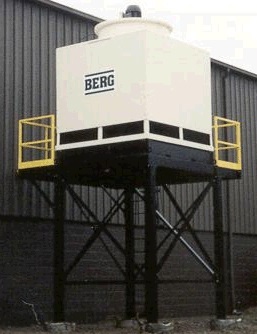 Berg’s fiberglass cooling towers are supplied with a structural primed and painted steel support base. Internal framing, all internal tower supports, fan motor bases, and hardware are constructed of series 304 stainless steel for long life and low maintenance. 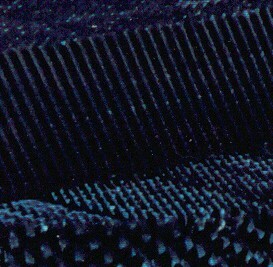 Inlet baffles reduce water spray from cross-drafts and bacteria growth due to sunlight exposure. The Wet deck is manufactured from rigid polyvinyl chloride (PVC) developed especially for fiberglass cooling tower applications where the continuous operating water temperature is 130°F or less. 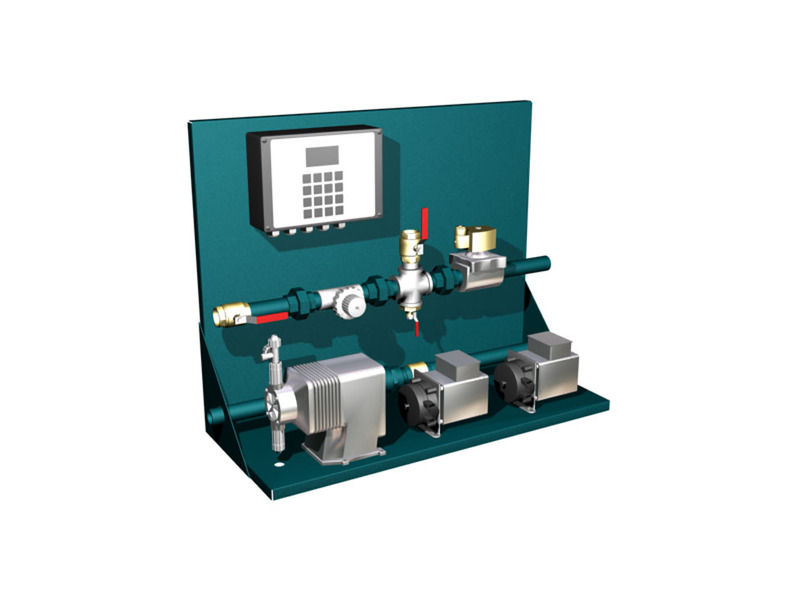 The eliminators are waveform, three pass type constructed of rigid PVC with UV inhibitors. Drift loss percentage is no greater than .002% of the design gpm. The water distribution system inside the industrial cooling tower is constructed of PVC pipe and connections and has no moving parts for maximum reliability. The nozzle features a non-clog design. High Efficiency Fans Rated in accordance with CTI standards. 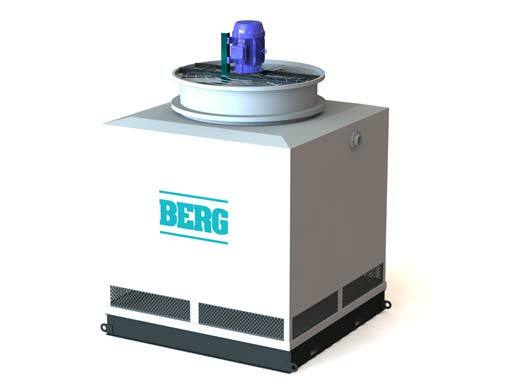 The cooling tower fan motor is available from 7-1/2 HP to 15 HP based on capacity. All cooling tower fan motors are NEMA approved design B, class F insulation, 40°C rise, 1.15 service factor, TEFC type rated for continuous duty at the horsepower required to produce the design water cooling capacity. The motors are single speed, single winding, 230 / 460 / 575 volt, 3 phase, 60 hertz, direct drive, and carry a five (5) year manufacturer’s warranty. The cooling tower fan assembly is designed and rated in accordance with CTI standards to provide maximum efficiency. The fan is a fixed pitch, multi-bladed design. 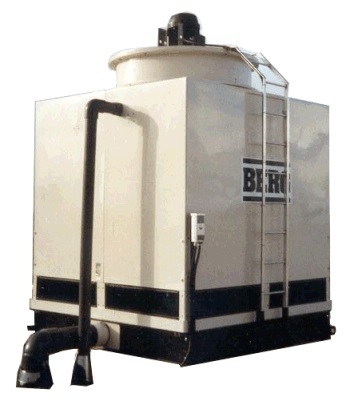 Berg fiberglass cooling towers are supplied with basin baffles to increase tower efficiency and minimize water carry-over during windy conditions. The shell, base, screen / louvers, internal supports, motor, fan and thermal performance of the fiberglass cooling tower carry a limited guarantee for a period to two (2) years from date of shipment. Industrial cooling towers are evaporative coolers used for cooling water or other working medium to near the ambient wet-bulb air temperature. Cooling towers use evaporation of water to reject heat from processes such as cooling the circulating water used in oil refineries, chemical plants, power plants and building cooling. An HVAC cooling tower is a subcategory rejecting heat from a chiller. Water-cooled chillers are normally more energy efficient than air-cooled chillers due to heat rejection to tower water at near wet-bulb temperatures. Air-cooled chillers must reject heat to the dry-bulb temperature, and thus have a lower average reverse-Carnot cycle effectiveness. Large office buildings, hospitals, schools typically use one or more cooling towers as part of their air conditioning systems. Generally, industrial cooling towers are much larger than HVAC towers. HVAC use of a cooling tower pairs the cooling tower with a water-cooled chiller or water-cooled condenser. A ton of air-conditioning is the rejection of 12,000 Btu/hour (12,661 kJ/hour). The equivalent ton on the cooling tower side actually rejects about 15,000 Btu/hour (15,826 kJ/hour) due to the heat-equivalent of the energy needed to drive the chiller’s compressor. This equivalent ton is defined as the heat rejection in cooling 3 U.S. gallons/minute (1,500 pound/hour) of water 10°F, which amounts to 15,000 Btu/hour, or a chiller coefficient-of-performance (COP) of 4.0. This COP is equivalent to an energy efficiency ratio (EER) of 13.65. 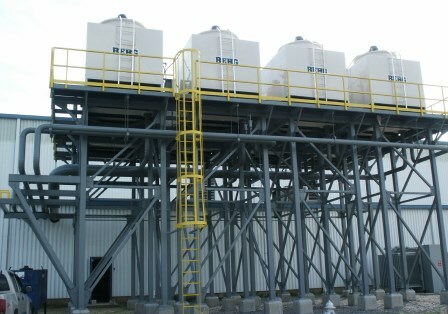 Industrial cooling towers can be used to reject heat from various sources such as machinery or heated process material. The primary use of large, industrial cooling towers is to remove the heat absorbed in the circulating cooling water systems used in power plants, petroleum refineries, petrochemical plants, natural gas processing plants, food processing plants, semi-conductor plants, and other industrial facilities. Wet cooling towers or simply cooling towers operate on the principle of evaporation. Dry coolers operate by heat transmission through a surface that divides the working fluid from ambient air. They thus rely mainly on convection heat transfer to reject heat from the working fluid, rather than evaporation. 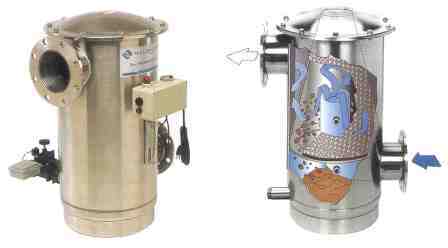 Fluid coolers are hybrids that pass the working fluid through a tube bundle, upon which clean water is sprayed and a fan-induced draft applied. The resulting heat transfer performance is much closer to that of a wet cooling tower, with the advantage provided by a dry cooler of protecting the the working fluid from environmental exposure. To achieve better performance (more cooling), a media called fill is used to increase the surface area between the air and water flows. Splash fill consists of material placed to interrupt the water flow causing splashing. Film fill is composed of thin sheets of material upon which the water flows. Both methods create increased surface area. In a wet cooling tower, the warm water can be cooled to a temperature lower than the ambient air dry-bulb temperature, if the air is relatively dry. (see: dew point and psychrometrics). As air is drawn past a flow of water, the two flows attempt to equalize. The air, if not saturated, absorbs additional water vapor, leaving less heat in the remaining water flow.